BGDB: When did you begin taking dance lessons? At what point did you realize it was your passion? EVF: I took my first real ballet class when I was 11 after I injured my elbows and had to leave Gymnastics. I picked it up quickly but it took time for me to fall in love with it. It wasn’t until my first time performing the Nutcracker with Ballet West that I started to really fall in love. There’s just something about being on stage for a huge audience and bringing a ballet to life! BGDB: What influences did ballet have on your childhood? EVF: My parents both grew up in poverty and things like ballet just weren’t part of their childhood. My mom wanted me to have more exposure to the arts then she’d had. I watched my first Nutcracker in San Diego when I was 2 years old. I loved watching ballets, but I never thought seriously about being a ballerina because as long as I could remember I had been a gymnast, training to compete for Tonga in the Olympics one day. BGDB: How do you honor your culture in pursuing ballet/dance? EVF: The Kingdom of Tonga is a small island nation with a proud tradition of exploration. I see what I'm doing as one of the first Tongan ballet dancers as an exploration. When I first started dancing I never thought that I was a pioneer, that I would make history, or become a role model. That’s the power of ballet though! This summer I was invited to perform the first classical ballet variation danced in Tonga as part of the coronation. You can’t imagine how thrilling, humbling, and terrifying that was! It’s amazing at my age and while still training as a ballet dancer to have these opportunities and to be in a position to influence others. I get messages from Tongan kids around the world who are now starting ballet classes for the first time. I tell them to always remember who they are and where they come from – to not try and fit in but to stand out and be proud of our heritage and who we are. Tongans are brown skinned, muscular people. We don’t fit the image most people have when they think of ballet. So what! Let’s change the image. Let’s be so good that they can’t ignore us! BGDB: How do you believe the dance world has shaped you as a young woman? What learning experiences can young girls gain from exposure to Ballet? Do you believe that ballet can change lives, if so how? 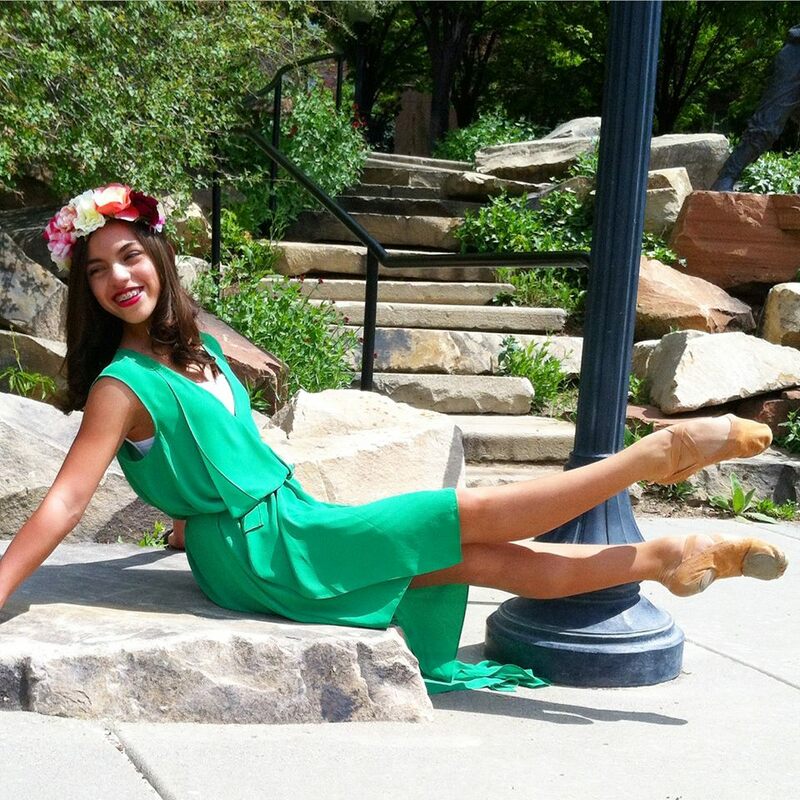 EVF: Ballet absolutely changed my life! I lived a real life fairy tale this summer. I danced for royalty at a coronation ball, attended royal feasts, and saw things I thought were only in story books. I am fortunate to have fans and supporters who send me their love and support every day. I have a chance to help and inspire other girls like me and to be a good example for Pasifika youth. Ballet made that happen! Ballet is so much more then what happens on stage! I wish every young girl – and boy – could take at least a year of ballet classes, even if they don’t want to be professionals. Our world is so fast paced and overwhelmed with technology. Taking just an hour away from that to go somewhere artistic, pure, and beautiful like the world of ballet can change everything by offering a new perspective and connection to something greater then ourselves. BGDB: Can you share with us some advice for parents and young girls alike who are interested in pursuing Ballet? EVF: My family’s not rich. In fact, we've struggled a lot this last year when my father, who is a disabled Marine Corps veteran, couldn’t continue working. My parents used up their savings to keep me in ballet. My mom sold her clothing to pay for my pointe shoes. I was at the barre in class with girls talking about their European vacations while I was wondering if we were going to be evicted that day and hoping my pointe shoes wouldn’t break down before my mom could find a way to get new ones. I see the miracles my mom pulls off every day to keep me training – all while caring for my special needs brother and my father. To the last second I didn’t think we were going to make it to the coronation in Tonga this summer but she barked up every tree in the forest to make it happen. If you’re serious about wanting a career as a ballet dancer, don’t let any obstacles stand in your way. Maybe your obstacles aren’t financial – maybe they’re physical or mental – the point is don’t let anything stop you. Be realistic about what it takes and whether you’re willing to pay the price and once you decide to go for it don’t stop until you get there. When you doubt or get tired, think of the next generation of little brown girls who's dance journeys will be made that much better because of what you are doing today! BGDB: What are your long term goals in the dance world? EVF: My long term goal is to be the prima of a big company and to dance the major ballets! But just as important to me is to bring ballet to the Kingdom of Tonga and to make it more accessible here in America. Performing in Tonga this summer opened my eyes to a lot of things. Dance is a massive and ancient part of Tongan culture and yet there is not a single dance studio in the country! I am proud that traditional Tongan dance will always be very important in our culture but there are many kids who are passionate about other dance styles as well who have to gather on the street or wherever they can to teach themselves. I realized it wasn’t that different for the kids in Tonga then it had been for my parents growing up here. There are too many children with no more access to ballet in the United States then those kids in Tonga have. Ballet may have started out as a dance for the elite but it can’t stay that way and survive. Dance companies and schools need to do a far better job of reaching beyond the barriers that keep ballet exclusive and make greater efforts to be inclusive and reflect the diversity of the world around us. That’s my true passion!